Giant sequoia located on Laburnum Drive in Trail, British Columbia, Canada. Thanks to Shane McCulloch for sending us this picture of a giant sequoia. 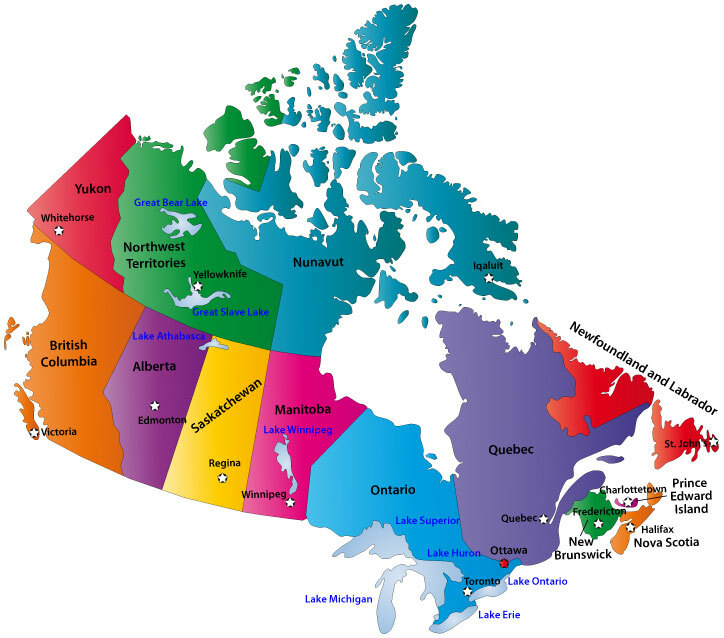 Shane said it is located on Laburnum Drive in Trail, British Columbia, Canada. He found it by accident doing a delivery when he went to the wrong house and saw it there. He didn't even think there were any sequoias in the interior of British Columbia. 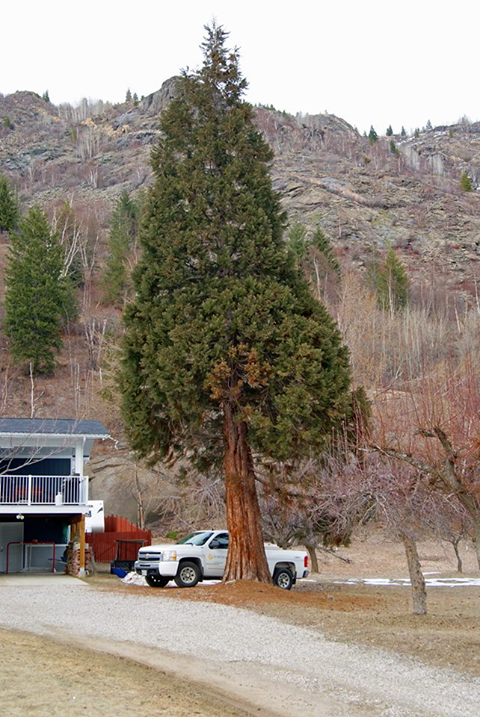 Giant sequoia tree located in the Kootenay region of British Columbia in a city called Nelson. Shane McCulloch sent us a picture of a giant sequoia tree located in the Kootenay region of British Columbia in a city called Nelson. He talked to the owner and he said the sequoia was planted in 1954, the crown is still intact but many branches on one side were trimmed due to being close to a power line. The owner says that it was one of two planted but only this one survived. He also said that he may get rid of the tree due to his fear of the roots affecting the basement walls. 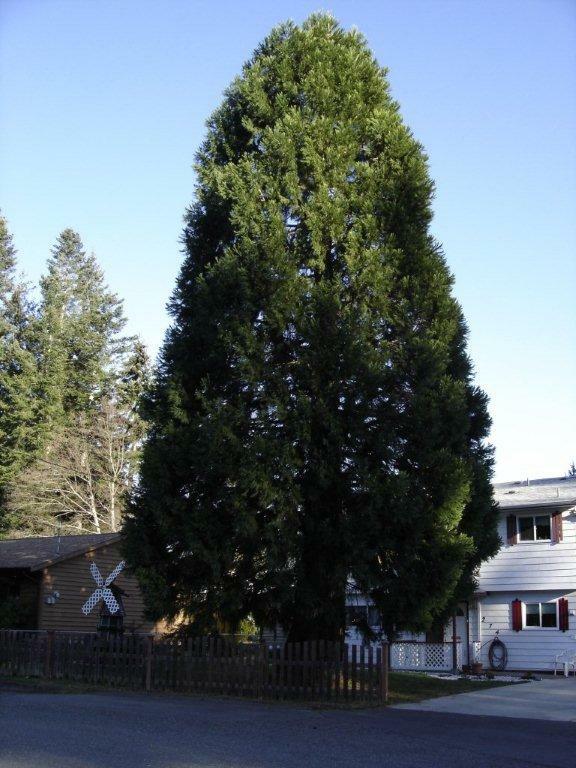 Thanks to Sarah from Surrey, British Columbia, for sending us this picture of a beautiful giant sequoia in her neighborhood. She has nominated this tree for Heritage status. 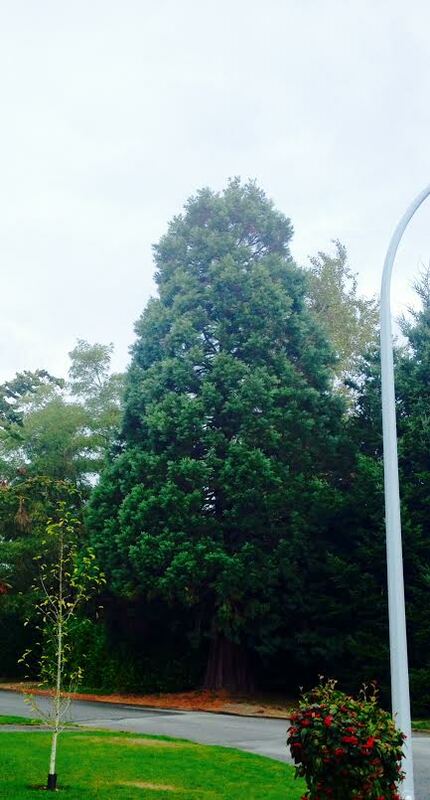 Another beautiful image from Sarah in Surrey, British Columbia showing how large this giant sequoia tree is. 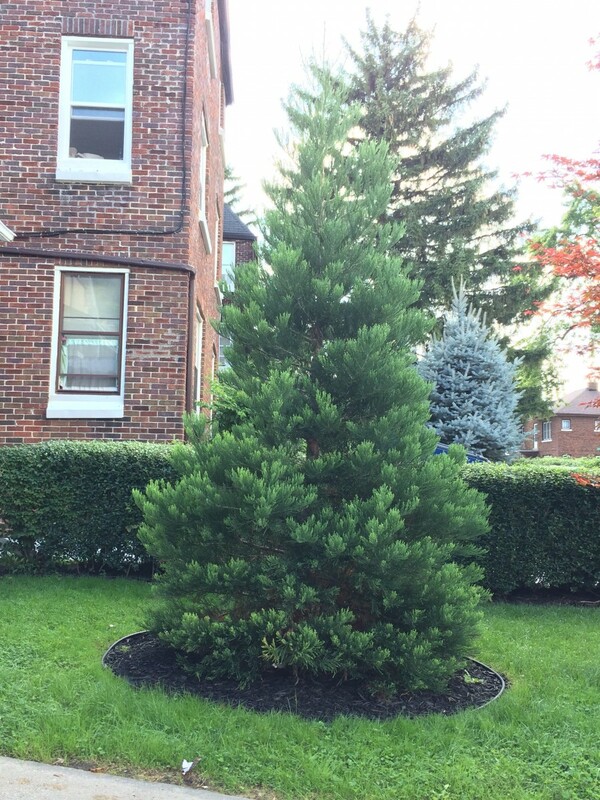 Gregg Kilner of Windsor, Ontario has worked with his giant sequoia for years. This is over 9 years young and 13 feet tall. It made it through a some very tough heat and cold so far. 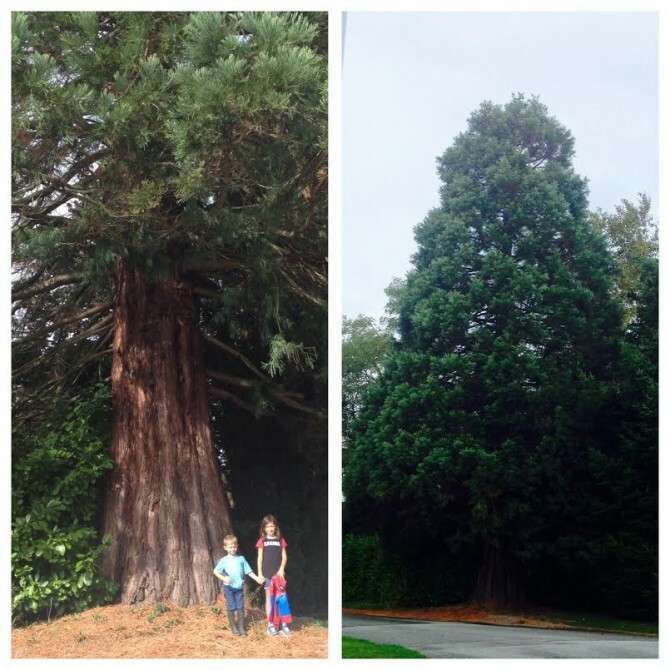 Thanks to Sarah from Surrey, British Columbia for sending us these images of another large giant sequoia tree she found in her area. 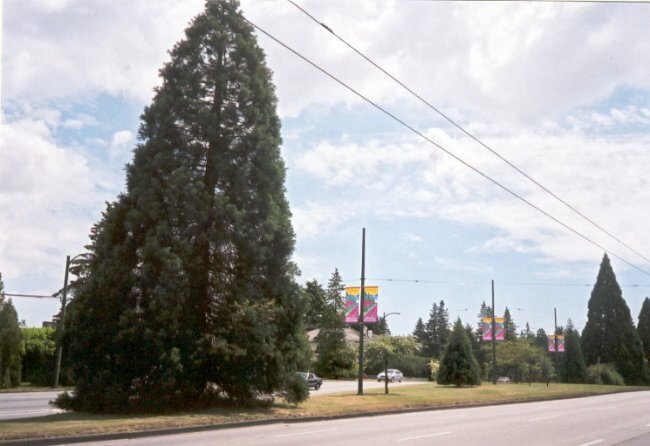 This tree has been designated Heritage Status in Surrey, BC. It was in the midst of a very controversial development and is now surrounded by skyscrapers...but still standing! Surrey, BC giant sequoia. Thanks to Sarah for sending us this picture. 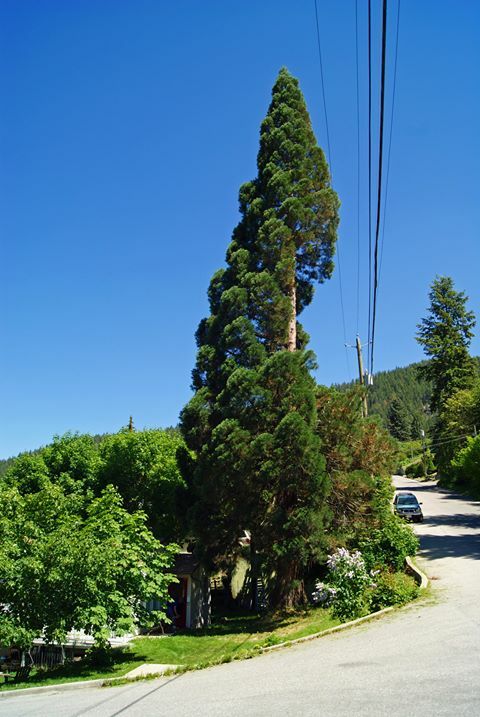 This tree is located in West Vancouver, one of Canada's wealthiest communities. It is just steps away from the ocean. Thanks to Gloria from Burnaby, BC for this picture. 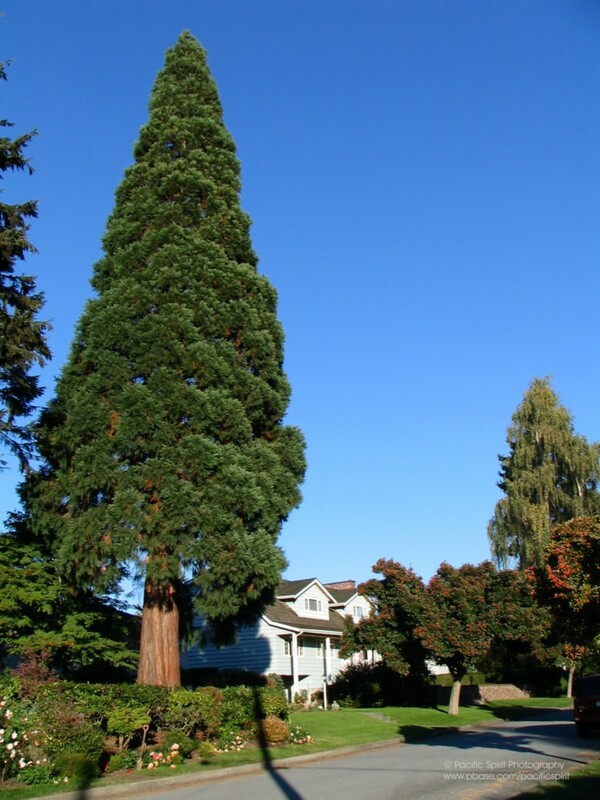 This is a gorgeous giant sequoia in the Lochdale neighbourhood of Burnaby, British Columbia. Taken by Gloria from Burnaby. Al Lands of sent this beautiful image of a 28 year old giant sequoia. Comox Valley in upper central Vancouver Island. Comox has the Ski Resort of Mt Washington and is an armed forces airport base. 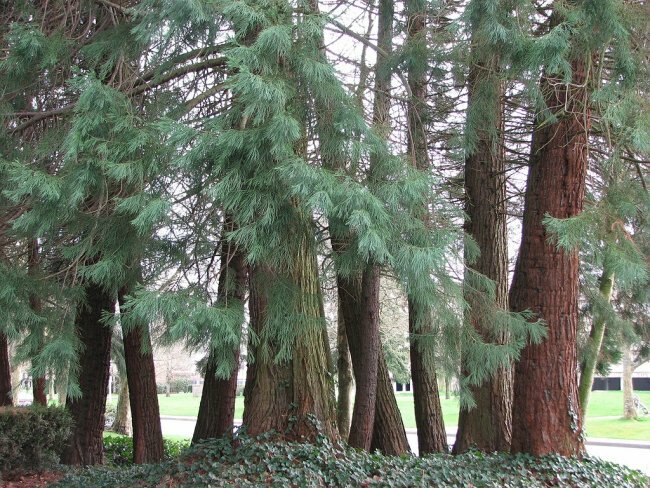 One of 17 giant sequoias planted many years ago in Victoria British Columbia. This was taken by fulltime painter Brandy Bain from this area. The giant sequoia is a gentle giant and awesome and inspiring to this painter and all of us. Silhouette of the giant sequoia trees nearby the painting studio of Brandy Bain of Victoria. This shows the very recognizable shape of a mature giant sequoia. Sara from Saskatchewan sent this image. 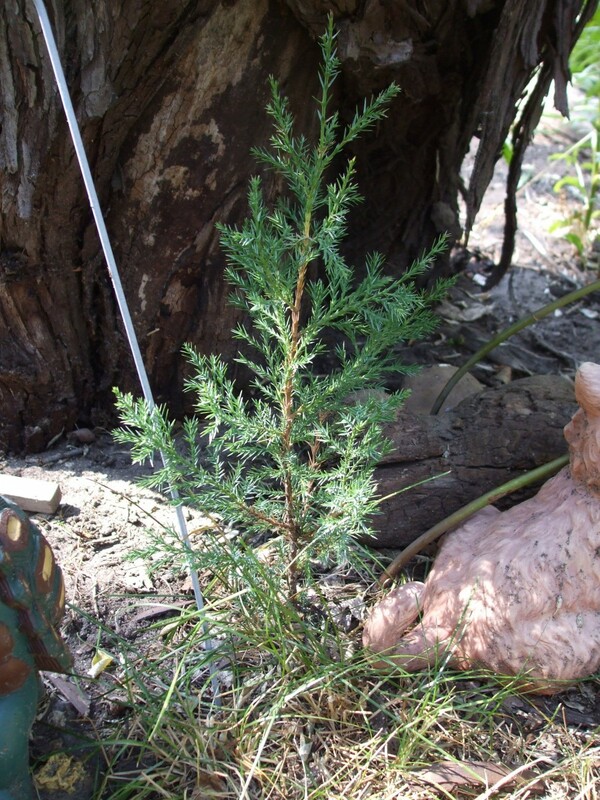 My family has found a small seedling in our yard that can only be a sequoia. We traveled to Sequoia National Park a couple years ago and collected a few seeds, we lost a couple of our seeds and the ones we tried to grow failed so we had given up, but the lost seeds must have blown out in the yard to give us a sequoia. We're wondering what we should do about the winter when it grows, because Saskatchewan winters are long and get close to -40 degrees at least once per year. It has survived the past two, but that would be because it is still shorter than the snow line. 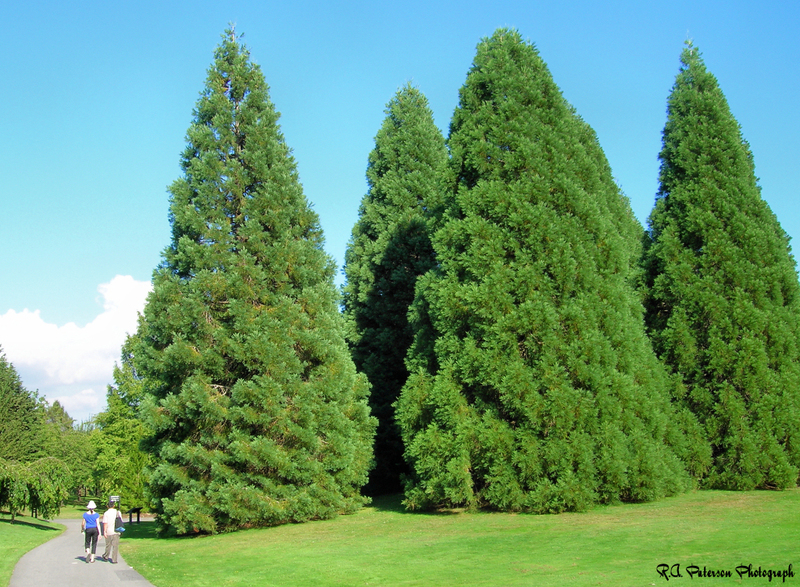 Richmond, BC giant sequoia grove - I visited your website looking for information on the sequoiadendron tree. There is a small grove of these trees growing in my neighborhood and I've taken some photos of them. Submitted by Jeanne Roe. The base around the giant sequoia tree located in Vancouver's Seabreeze Walk sent by Alvin Klippenstein. Thank you Alvin for this addition. Giant sequoia near the Burrard Bridge at Seabreeze Walk just West of Hornby St. in Vancouver taken by Alvin. A satellite image of the awesome tree with its shadow near the Burrard bridge of Vancouver sent by Alvin. BC Parliament Building Giant Sequoia - Here is another view of this magnificient tree. Perhaps that is Evan down there being dwarfed by the monstrous tree. Submitted by Evan on 11-10-07.